Audi 3.0 Biturbo TDI prices announced | What Car? Prices for Audis new Biturbo TDI (BiTDI) models have been announced. The new twin-turbo 3.0-litre diesel engine is available for the A6 saloon, A6 Avant and A7 Sportback, with prices starting at 43,180. The new Audi BiTDI models use a twin-turbo version of the existing 3.0-litre V6 TDI diesel engine. Maximum power is 309bhp, from 3900rpm; peak torque is 479lb ft, from 1450rpm. The new BiTDI models sit above the existing 201bhp and 242bhp 3.0 TDI models. All BiTDI models have four-wheel drive and an eight-speed automatic gearbox as standard. Average fuel economy for all versions is 44.1mpg; the CO2 emissions figure is 169g/km. 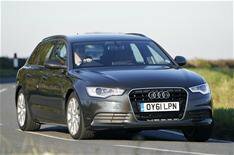 The figures for comparable 242bhp 3.0 TDI models are 47.9mpg and 156g/km respectively. Standard equipment for the new BiTDI models includes a new exhaust-mounted sound actuator - a speaker system thats designed to give a sporty exhaust note similar to that of a high-powered petrol engine. Audi has confirmed that the BiTDI engine will be available for the new A6 Allroad quattro, which is available to order in February. Wed expect to be introduced to the A8 and Q7 ranges, too, although Audi hasnt confirmed this yet. Theres a 4700 premium for BiTDI models over 242bhp 3.0 TDI A6 models, and a 3635 premium over the comparable A7. A6 Sportback 3.0 BiTDI quattro S line 53,435.